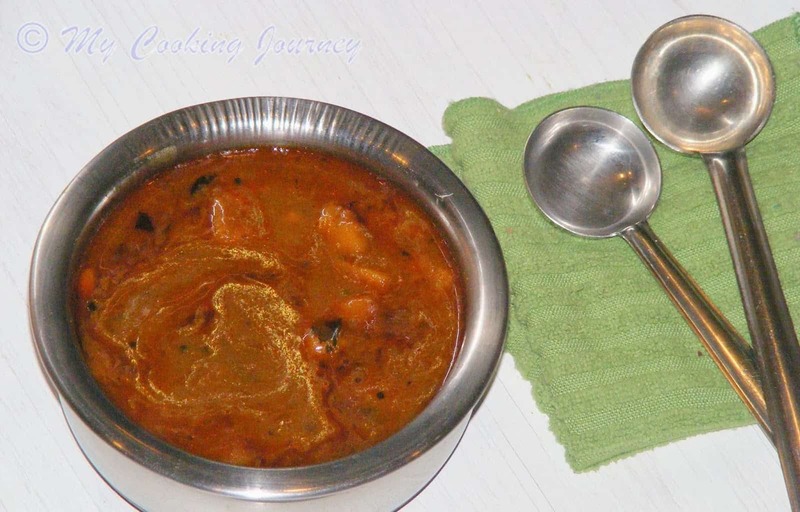 Arachuvitta Vathal Kuzhambu with Sundakkai and Drumstick, is a flavorful gravy made that is a South Indian specialty and is perfect for the weekend lunch spread. 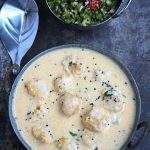 Vathal Kuzhambu is my comfort food! Luckily my boy’s have taken over me and they would eat Vathal Kuzhambu every day of the week. 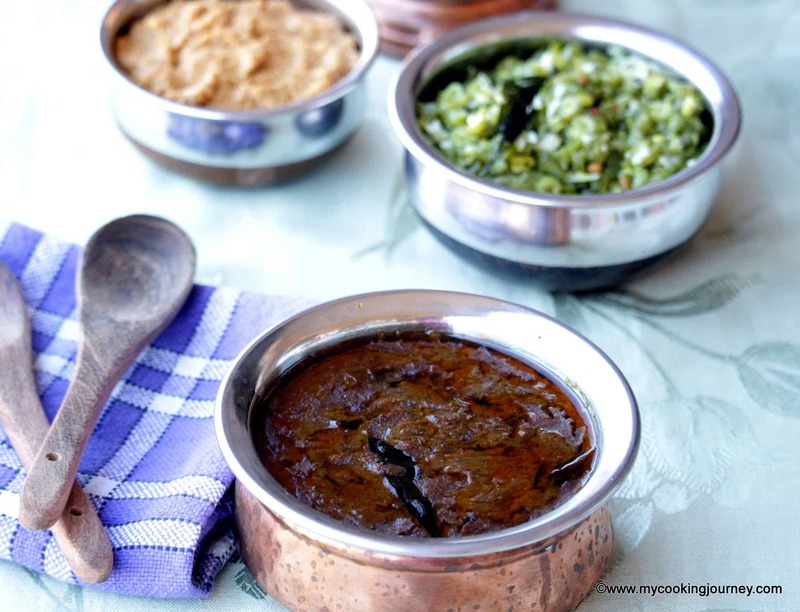 I loved my Mother’s Vathal Kuzhambu and have eaten nothing better than hers. Luckily I have seen her make it many times and I am quite comfortable making a pretty good Vathal Kuzhambu. 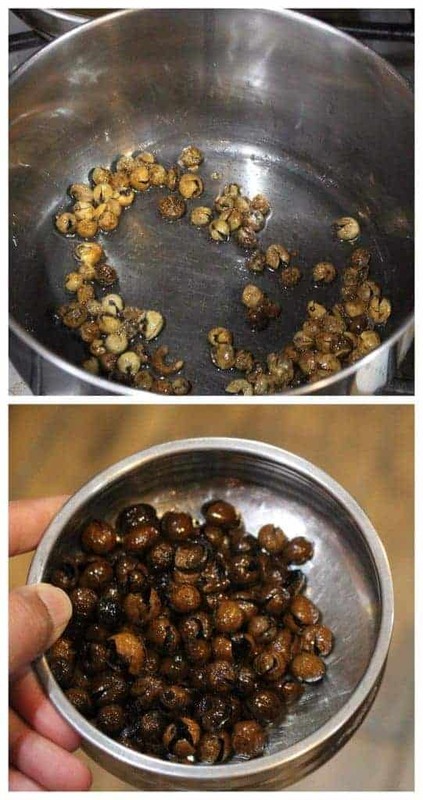 Just a couple of months before my mother passed away, she told me that she made a different kind of Vathal Kuzhambu called the Arachuvitta Vathal Kuzhambu and it tasted really good. She gave me the recipe over the phone, but I did not write it down then. This Arachuvitta Vathal Kuzhambu has been in the back of my head since then. I just vaguely remember the recipe and hence never made it. 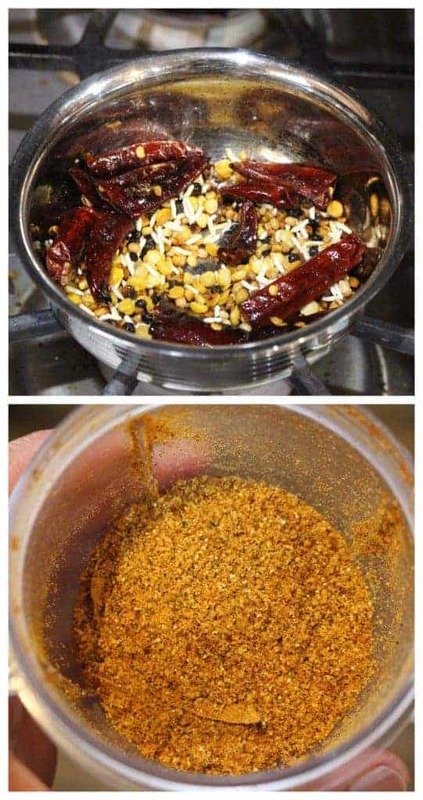 Few months back, one of the member from a cooking group that I am a part of on Facebook, posted this recipe. I immediately remembered my mother’s recipe and I was so happy. Thanks to Jayanthi Nagarajan Madam for her recipe. 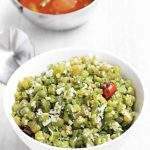 This Arachuvitta Vathal Kuzhambu, tastes just like the kind of vathal kuzhambu we eat at weddings and in restaurants. The flavors were amazing and it also gave me a chance to use my favorite Sundakkai Vathal / dried Turkey berry. 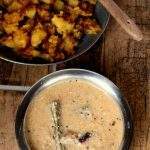 In the past, I have used the Sundakkai usually only in More Kuzhambu, but now I have one another recipe that I could use it in. I made this Arachuvitta Vathal Kuzhambu over the weekend with Beans curry and Tomato Juice rasam. 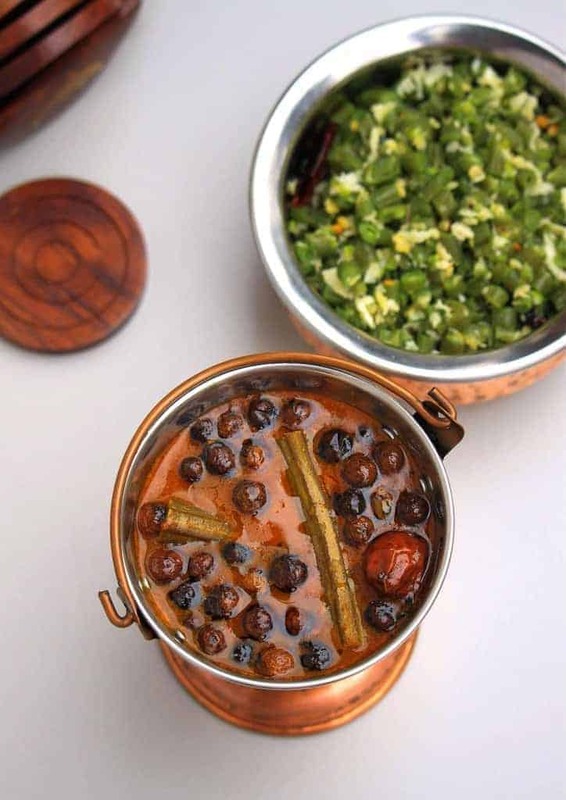 I am working on ‘Meal time dishes’ theme this week in BM and the Arachuvitta Vathal Kuzhambu is my first recipe under the theme. In a small pan, heat 1/2 tsp of oil and fry all the ingredients mentioned under ‘roast and grind’ until aromatic. Soak the tamarind in about 2 cups of hot water and extract the juice. If needed, add one more cup of hot water and extract that water as well. In a heavy bottom pan, heat 1 TBSP of oil and fry the sundakkai / turkey berry until dark brown. Make sure that you fry it with enough ventilation and in low heat to avoid burning and excessive smoking. Remove the turkey berry into a bowl. In the same pan, heat the rest of the oil. 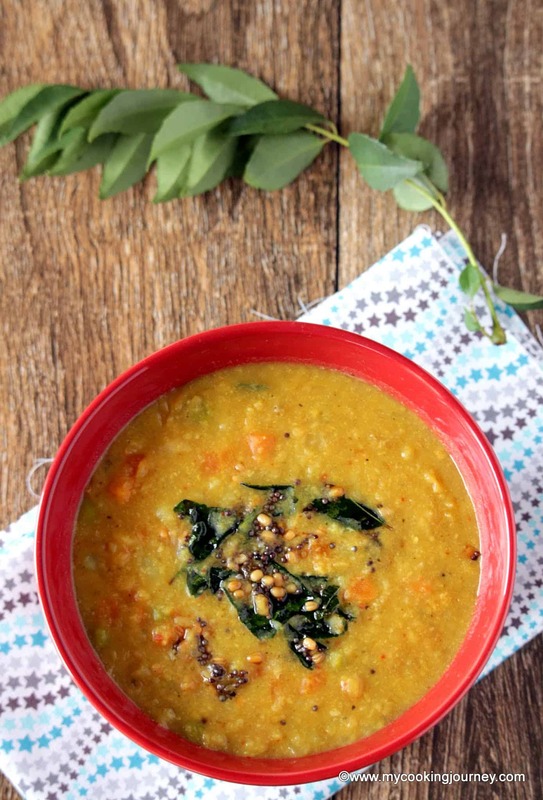 Add the mustard seeds, toor dal, red chilies and asafetida and let it fry. Add the chopped murungakkai / drumstick and cook it for about 3 to 4 minutes. Pour the extracted tamarind water to the pan along with turmeric powder and salt needed. 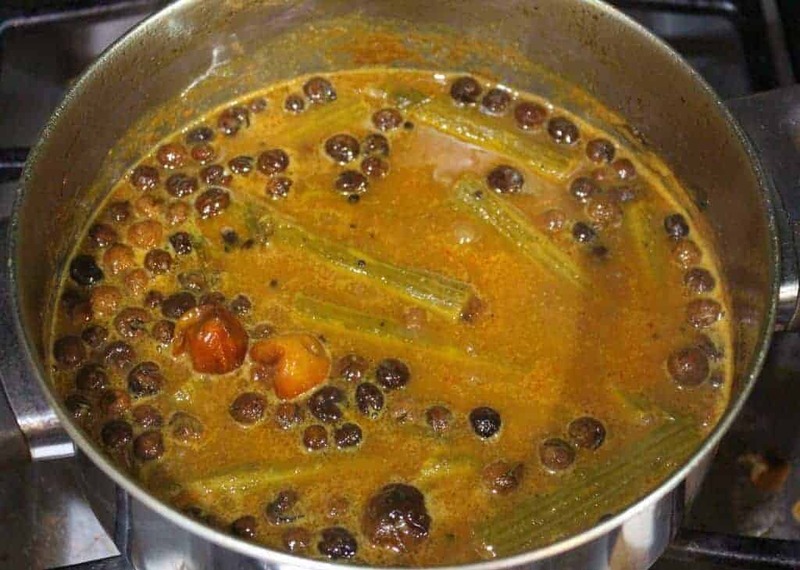 Let the kuzhambu come to a boil and then add the curry leaves. 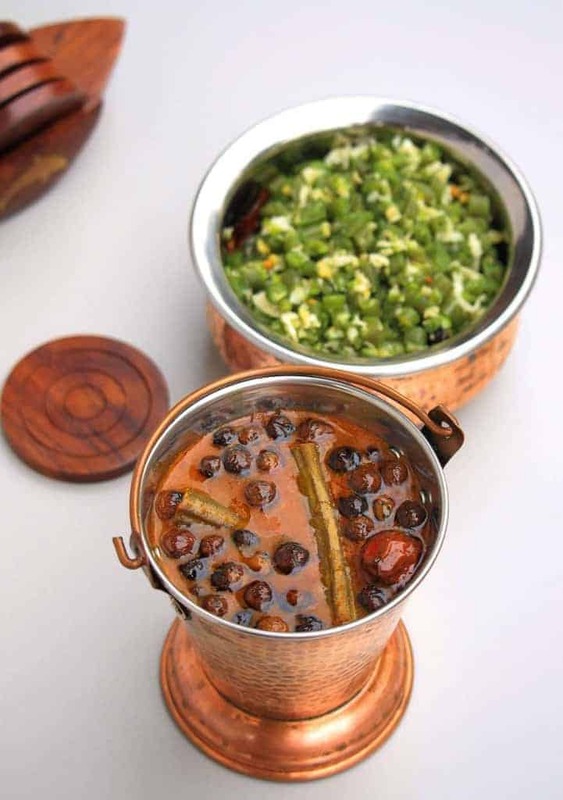 Simmer the kuzhambu for about 10 minutes or until the raw smell of the tamarind disappears and the vegetable cooks. Dissolve the ground powder in water and add this to the boiling kuzhambu. Make sure you dissolve the powder in water otherwise it will clump up in the kuzhambu. Let this boil for another 7 to 8 minutes. 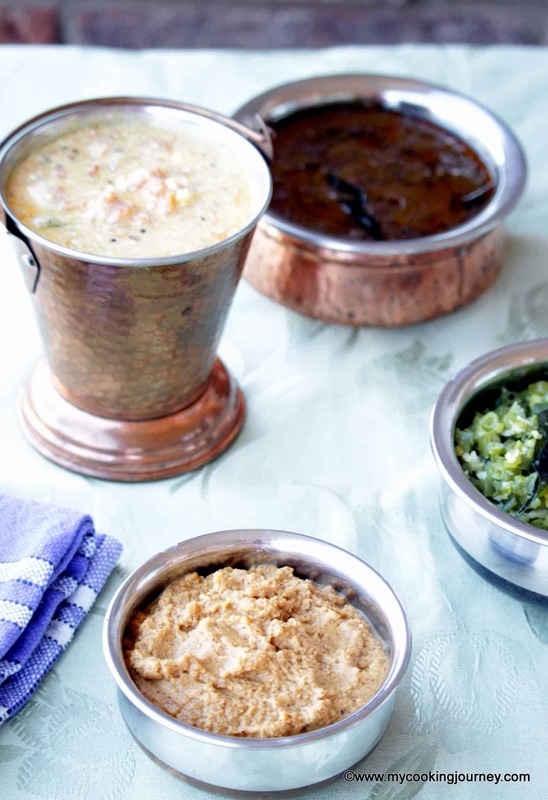 You will notice that the kuzhambu will thicken after we add the ground paste. 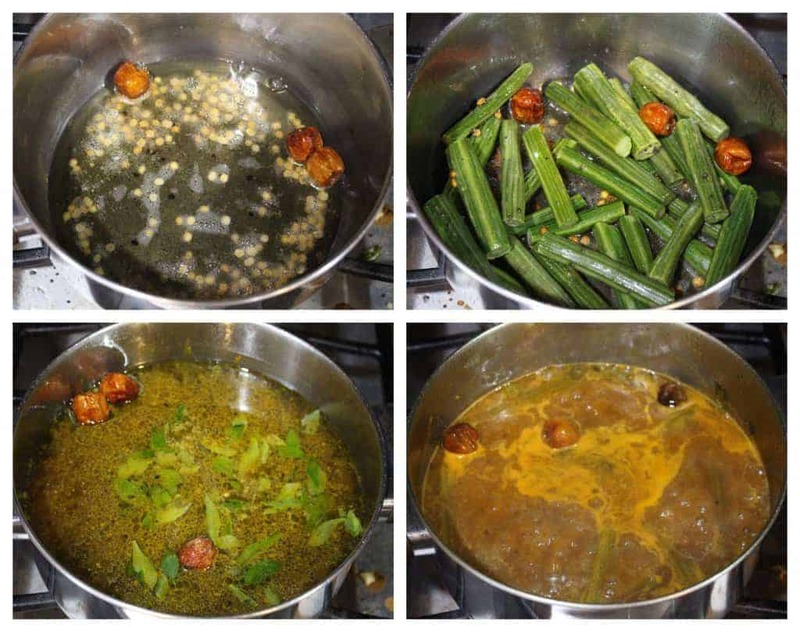 At the end add the fried sundakkai vathal / turkey berry to the kuzhambu and let it boil once more. Turn off the flame and serve it with hot rice and ghee / nei. In a small pan, heat 1/2 tsp of oil and fry all the ingredients mentioned under 'roast and grind' until aromatic. 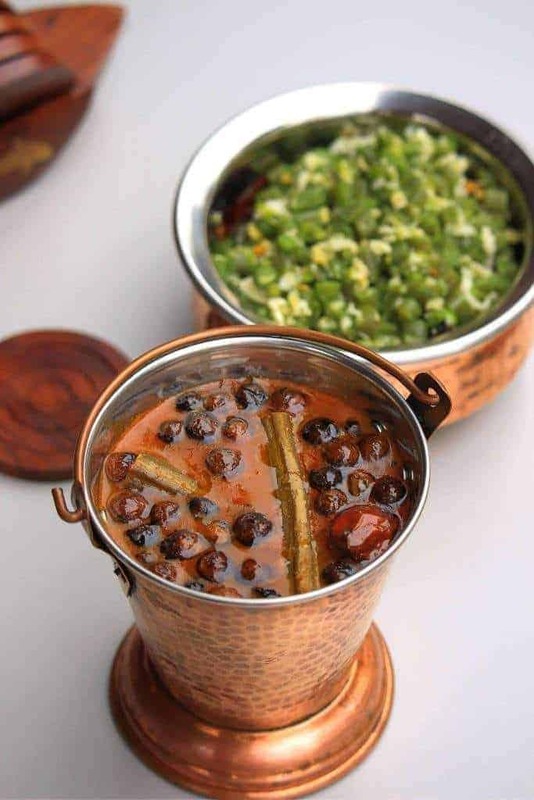 Omg, am literally over that fingerlicking arachivitta vathal kuzhambu, wish i get a bowl of this kuzhambu with some rice and papads.. Makes me hungry already. I love sunda vathal in vathal kulambu. With the tang from tamarind, it tastes amazing. 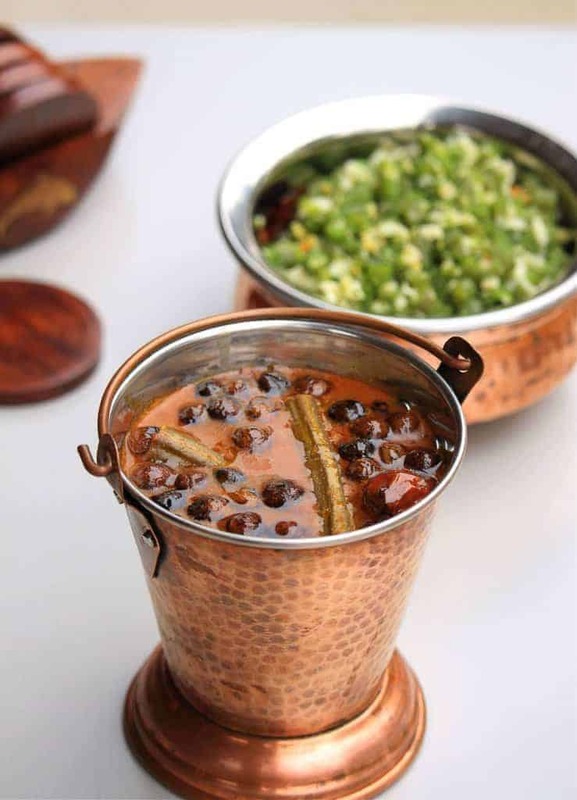 Looking at your freshly ground spiced vathal kulambu, I am drooling here. 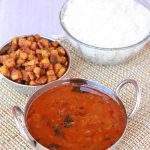 Sounds like a great recipe Sandhya as my husband is very fond of vathal kuzhambu .. Recipe sounds like a very yummy dish. Would love to try this soon. 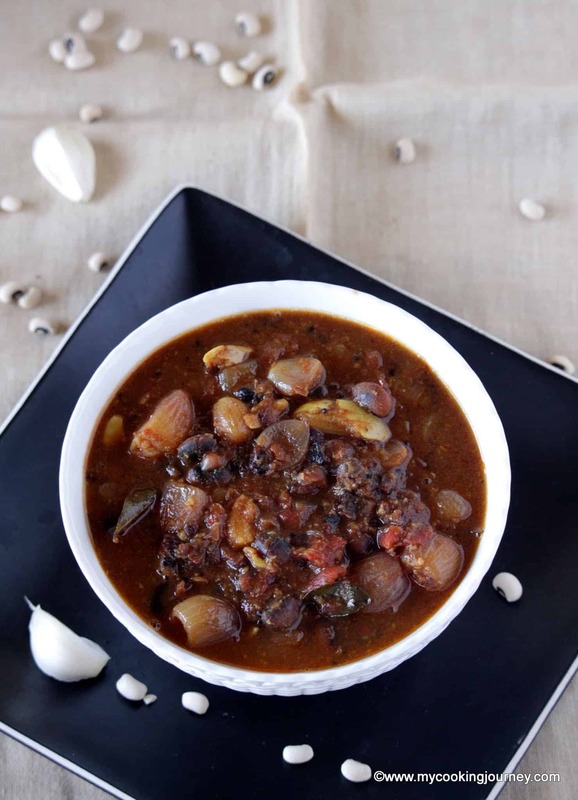 This looks like a comforting stew with tangy tamarind in it..I never tried this dish.. it’s an interesting dish for me to try!! Loved the pics!! I have seen these berries in the Indian store shelves and am yet to explore these. I shall bookmark to try rhis lip smacking kuzhambu. I must have some berries left from the stash I got from my India trip. I will try if this interesting kuzhambu for sure. 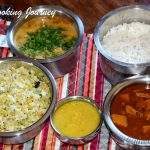 The dal and the curry both look so inviting.